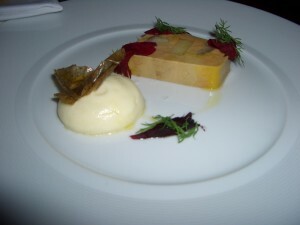 Maze is a very modern fine dining restaurant, in everything from the ambience and dress code right through to the food. The menu is a ‘tapas’ style tasting menu with individual dishes costing between £8 – £15 each. The chef recommended selecting 2 or 3 starter dishes and 2 main courses. I chose 3 starters and 4 main courses, being a tasting menu I wanted to taste as much as possible! Pumpkin latte with roasted duck & black truffle. Mushroom brioche on the side. Smoked eel, fois gois and baked potato foam and dill. Roasted scallops with textured pear, apple & bacon. Roasted hake wrapped in Parma ham, chorizo and pimento puree with squid ink. Halibut with black pudding, celeriac and sauce diable, with curly kale. Roasted squab, spiced pumpkin butter, chestnuts, brussell leaves & Madeira sauce. Pork belly, pigs head & parsnips. Sweetcorn vanilla panna cotta, salted and sweet popcorn, popcorn sherbet. Every single dish was stunning. Standouts were the scallops, both fish main courses – particularly the halibut with black pudding and my favourite dish of the evening and one of my favourites of all time, the smoked eel & fois gois. I’d never eaten eel before but I loved it and can’t wait to have it again. Finally, some thoughts on the restaurant. Although I enjoyed the food as much as any of the other top restaurants I have visited, I felt that their attempts to be ‘informal’ actually reduced the overall experience somewhat. I still had a fantastic time and an average restaurant wouldn’t even come close to it. But after the high standards of Claridges and the 3 Michelin starred Restaurant Gordon Ramsay in Chelsea, Maze didn’t quite live up to them in terms of level of service and attention received from staff.